Donegal lead the nominations for this year's Football All Stars with 12 of their All-Ireland Final team among the 45 contenders announced on Wednesday. Only Leo McLoone, Ryan Bradley and Patrick McBrearty miss out from the All-Ireland winners although McBrearty is nominated for young player. Karl Lacey, Colm McFadden and Frank McGlynn are the three footballer of the year contenders. Jamie Clarke and Down's Conor Laverty are the only other Ulster nominees. Clarke helped Crossmaglen retain the All-Ireland Club Football title and tried manfully to inspire a meaningful Championship challenge from Armagh before the county's surprise exit against Roscommon in the qualifiers. 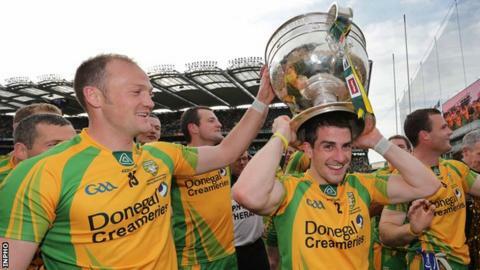 However while Clarke is nominated, Donegal look likely to dominate the GAA and GPA All Star selection. Goalkeeper Paul Durcan is joined by all six members of the defence in being nominated. The McGee brothers Eamon and Neil and corner-back Paddy McGrath are full-back nominees with Lacey, McGlynn and Anthony Thompson among the nine half-backs in contention for awards. Neil Gallagher and Rory Kavanagh are among the midfield hopefuls with Mark McHugh, McFadden and captain Michael Murphy all in line to be named in the team of the year's attack. McHugh can consider himself unlucky not to have been among the three Footballer of the Year contenders although he wasn't as ineffective in the All-Ireland decider as in earlier games. Beaten All-Ireland finalists Mayo have been handed 10 nominations with David Clarke, Ger Cafferkey, Keith Higgins, Colm Boyle, Lee Keegan, Barry Moran, Aidan O'Shea, Alan Dillon, Kevin McLoughlin and Andy Moran all in contention. Cork have seven nominations with last year's All-Ireland champions Dublin getting six with Meath (Donal Keogan, Graham Reilly) and Longford (Michael Quinn and Paul Barden) the only other counties to earn more than one nomination. Colm Cooper is the only Kerry player to make the 45-strong list. Beaten Connacht finalists Sligo do not get any nominations with Adrian Marron perhaps unlucky not be included after scoring 2-6 in the win over Galway. Full-backs: Eoin Cadogan (Cork); Ger Cafferkey (Mayo); Keith Higgins (Mayo); Donal Keogan (Meath); Eamon McGee (Donegal); Neil McGee (Donegal); Paddy McGrath (Donegal); Rory O'Carroll (Dublin); Michael Shields (Cork). Half-backs: Emmet Bolton (Kildare); Colm Boyle (Mayo); Adrian Flynn (Wexford); Lee Keegan (Mayo); Karl Lacey (Donegal); Frank McGlynn (Donegal); Kevin Nolan (Dublin); Michael Quinn (Longford); Anthony Thompson (Donegal). Midfielders: Neil Gallagher (Donegal); Rory Kavanagh (Donegal); Barry Moran (Mayo); Aidan O'Shea (Mayo); Brendan Quigley (Laois); Aidan Walsh (Cork). Half-forwards: Paul Barden (Longford); Alan Dillon (Mayo); Paul Flynn (Dublin); Paul Kerrigan (Cork); Michael Darragh Macauley (Dublin); Mark McHugh (Donegal); Kevin McLoughlin (Mayo); Graham Reilly (Meath); Ciarán Sheehan (Cork). Full-forwards: Bernard Brogan (Dublin); Jamie Clarke (Armagh); Colm Cooper (Kerry); Conor Laverty (Down); Colm McFadden (Donegal); Andy Moran (Mayo); Michael Murphy (Donegal); Donncha O'Connor (Cork); Colm O'Neill (Cork).